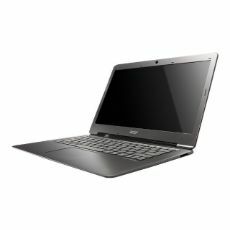 Enjoy life on the go in an instant with the Aspire S Ultrabook - Acer's mobile and responsive notebook. This techno-wonder comes in an ultra-aerodynamic, super-slim design, yet delivers everything you expect from a standard-size notebook. First we reduced the size, then we reduced the price. Introducing the Acer S3 Ultrabook, the PC that will have you instantly powered on and connected to the Web in no time- and at a price you can afford! The ultrathin 13.3" design weighs in at just under 3lbs and is only .7" thin while packing powerful 2nd Gen Intel® Core™ i5 processor performance. All the best new experiences in a streamlined design, changing your mobile-computing way of life! The S3 Ultrabook weighs in at just under 3 lbs and measures only 0.7" thin! Comfortably carry it under your arm or simply slip it into a backpack or tote bag. This pure, uncluttered design not only looks good- but enhances your everyday computing experience. Every single detail has been carefully selected to give you the very best, from the large multitouch touchpad for seamless interaction to the essential ports you need. The 13.3" widescreen LED-backlit display delivers a true cinematic view with16:9 aspect ratio so you can enjoy surfing the Web, streaming your favorite shows, social networking and more- all in stunning HD! Built with the energy-efficient 2nd generation Intel® Core™ i5 processor, the S3 Ultrabook adapts to your needs and wakes up in a flash! It delivers extra performance when you need it, along with sharper, richer visuals for enhanced multimedia enjoyment. Acer Instant On resumes your computing session within seconds! Thanks to the ultra-fast 240GB SSD drive, just open the lid and any emails, Websites, or word docs you had open are instantly restored. Acer Green Instant Connect provides quick access to the Internet by remembering previous Wi-Fi spots you've visited so when they're in range, you are instantly connected. Low power consumption through Acer Hybrid Standby Technology enables up to 50 days of standby power and up to 6 hours of continuous usage and work confidently knowing you'll always be powered on and ready to go. Enjoy wireless freedom to roam with integrated 802.11b/g/n Wi-Fi and simplify your digital world eliminating cables with Bluetooth® wireless technology. Listen to movies or music in vibrant theater-like sound with Dolby® Home Theater® v4. Enjoy powerful beats or smooth melodies over the S3 Ultrabook PC speakers, headphones or a home theater system. Experience your media and gaming the way you were supposed to thanks to Intel® HD Graphics 3000 delivering crystal-clear images and brilliant color for stunning life-like visuals. Connect your S3 Ultrabook to an external monitor, projector or TV through a single cable using the HDMI™ port for big-screen enjoyment! Share your favorite HD media with friends and family! Acer Clear.fi™ allows you to manage, store, share, and enjoy media between any Clear.fi enabled devices, in any room throughout your home. Advanced 1.3 Megapixel HD Webcam provides high pixel density for amazing video image quality and 24 frames per second! Chat with friends and family in crystal-clear viewing or snap still pictures all in HD!